I put the pictures of the model on a separate page so that it would not take so long to load for those that have dial up. I hope you enjoy looking at it as much as I enjoyed making it. This description on how it looked based on the descriptions by JMA in TMH: I did change the length of the lodge to fit everything in. In the book the lodge is 80x20x12 I modified it to 100x20x12. The outside wall is 2 ft thick (might have been thicker) but I drew it 2 ft. The entrance's are 6ft wide. Both the Main and the one into the Horse annex and into the Mammoth Hearth. The entrance area is 10x20 with 2 ft of storage platforms all the way around. (the boundary between hearths is marked with a - - - - line). The opening into the Cooking Hearth is also 6ft wide. The Cooking area is 14x20 with no bed platforms. Just 2ft wide storage platforms along both walls. 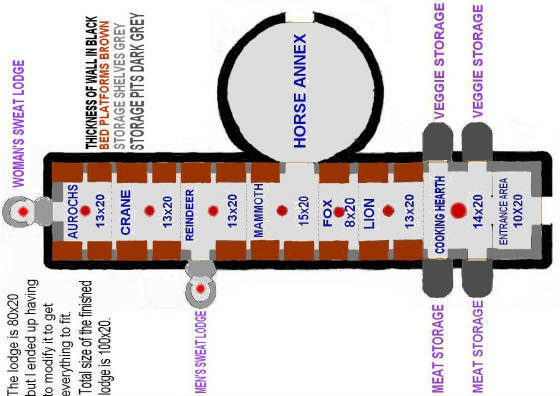 There are 2 storage pits per side. The ones on the left are for meat 6x10. The ones on the right are for vegetables 6x8. 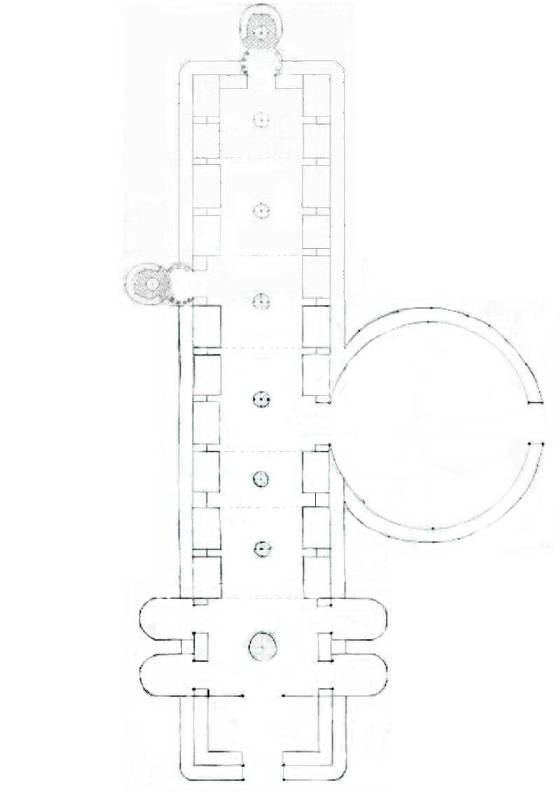 With 4ft wide doorways. The Lion Hearth is 13x20 there are two, 6ft long by 4ft wide bed platforms per wall. With 1ft of storage between each. The Fox Hearth is only 8x20 with 1 bed platform per wall and 2ft of storage between the Lion and Fox bed platforms. 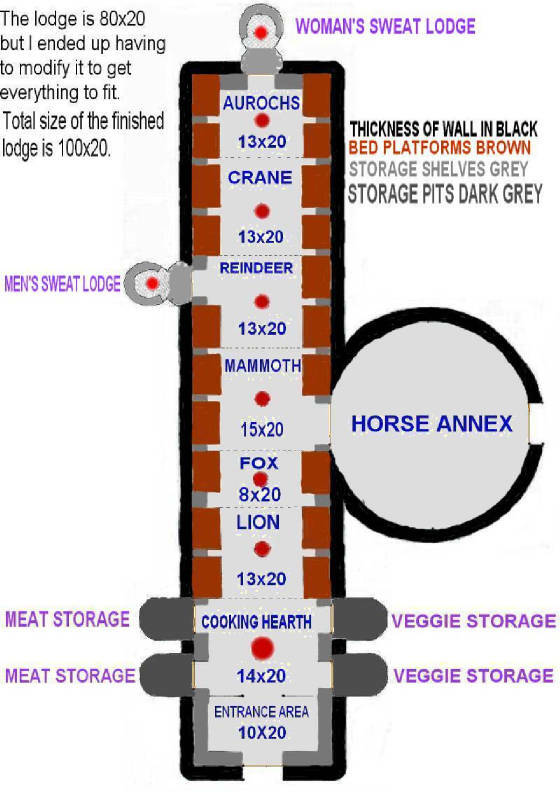 The Mammoth Hearth is 15x20 there are 3 bed platforms, with the opening to the Horse annex on one wall. The opening to the Horse annex is 6ft wide. It is a 30x30 circle. With a opening to the outside of 6ft. The opening to both the sweat baths is 4ft wide. 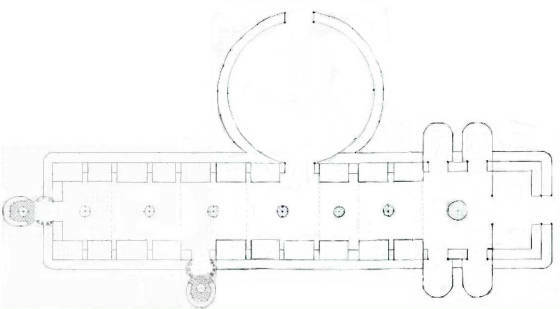 The sweat baths are 6x10 circular in shape with the first circle smaller than the other one. There is a fire in the center and mammoth bones on the floor in the larger circle to allow for water drainage and there are coals under there as well. There are large animal stomachs along one wall filled with steaming water. The other wall has large containers of water. The Crane Hearth is 13x20 with four bed platforms, 3 of them are 4x6 and one is only 4x5 because I put storage space between the 2 hearths instead on one long bed platform. The Aurochs Hearth is 13x20 It has two bed platforms that are 4x6 and two that are 4x5 again so I could put in storage between the 2 hearths. 2 ft storage shelves are along the back wall on either side of the sweat bath doorway. To me the description of bed platforms implies that each bed platform is separate from the next with storage area between. I think if they had been one long platform it would have been described that way. So I made storage between every bed. Especially between the beds of adjoining hearths. Also it would have been kinda weird to me to have your neighbor kicking you in the head at night. I figure the smaller platforms (5x4) the kids slept in. I hope that is clear enough. I hope you enjoy looking at it. THE TOP DRAWING IS JUST BASIC BLACK AND WHITE. SCROLL DOWN FOR THE DRAWING WITH COLOR ADDED.